This 4-in-1 meter replaces 4 traditional meters to make your work a lot simpler and efficient. Includes Sound level, Light, Humidity and Temperature measuring. 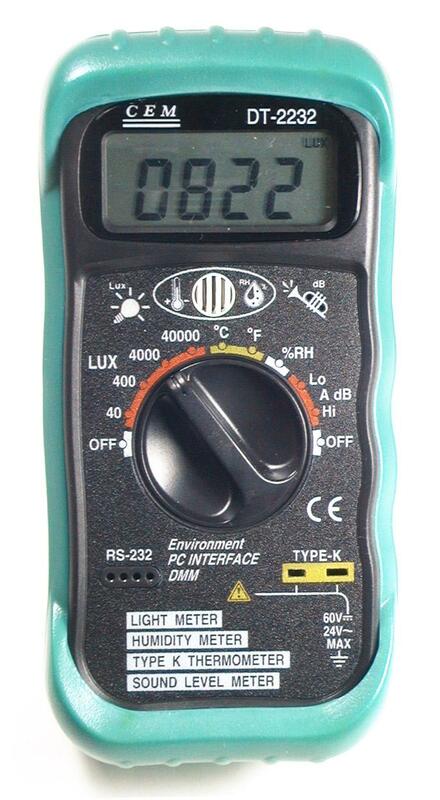 This is a brand new CEM DT-2232 CE certified industrial digital multi-function environment meter. This 4-in-1 meter replaces 4 traditional meters to make your work a lot simpler and efficient. Forget about the old analog devices. This newly designed digital light weight device gives you long lasting power with accurate measurement. The built-in Sound level, Light, Humidity and Temperature measuring, functions replace meters with over $600 combined cost. * 4 in 1 for Light meter, Sound Lever meter, Relative Humidity meter, Temperature meter. * Light measuring levers ranging from 0.01 LUX to 40,000LUX. * Complete with rubber holster, test leads, type -K temperature probe, RS-232 PC cable and software CD. Sound Lever (Frequency Weighting: A) Lo: 35dB ~ 100dB 0.1dB +/- 3.5dB at 94dB sound level, 1KHz sine wave.